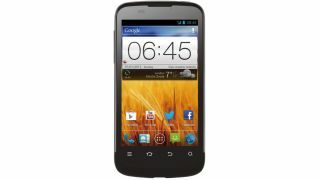 The ZTE Blade 3 has been officially announced by the Chinese firm and promises big value and a big screen experience. ZTE is best known as a budget smartphone manufacturer, and while it's trying to shift that reputation with flagship products such as the Grand S there's no question where the Blade 3 sits in the market. The Blade 3 will only set you back £69.99 plus £10 PAYG top up, or if you prefer you can have it for free on contact starting from £13 per month (as long as you are a Virgin Media customer). For your £80 outlay you'll get a 4-inch 800 x 480 TFT display, 1GHz single-core processor, 512MB of RAM, 4GB of internal storage (of which 2.5GB is available), 5MP rear camera, 1,600mAh battery a Android 4.0.4 Ice Cream Sandwich. That's a decent set of specs for the money and puts the Blade 3 up against the more expensive Sony Xperia Miro and HTC Desire C which are both almost £100 dearer. We were pretty impressed during our hands on ZTE Blade 3 review but we'll reserve proper judgement for our full in-depth review.